Should You Be Paid for Housework? 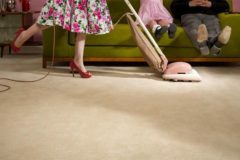 Do you think husbands should pay stay-at-home wives for housework? It’s a burning question in India, where its Ministry of Women and Child Development is considering a draft bill that would require men to pay a percentage of their salaries to compensate wives for the work they do around the house. The feminist in me says, “Yahooo!” It’s about time someone put a price on the housework I perform every day. Hey, the dishwasher doesn’t empty itself. But second thoughts raised several questions. How do you price each chore? Is mopping floors more valuable than doing laundry? Deep cleaning more than regular dusting? If I hire a cleaning crew every two weeks, does that reduce my “salary,” even though I’m doing housework between visits? What if I work outside the home and my husband does the housework? Do I pay him? What if we split chores? What if our son takes out the garbage (I should live so long)? What’s the open market value of a three-course dinner made from scratch, versus a microwave lasagna and bag salad I serve in a pinch? My parents would have cringed at the thought of paying Mom for her work around the house. My father made the living; my mother made the home. His salary was their money. Until they split, and “their” money became a negotiated item in their divorce. This entry was posted on Monday, June 5th, 2017 at 9:14 am	and is filed under Random Thoughts. You can follow any responses to this entry through the RSS 2.0 feed. Both comments and pings are currently closed.